I’m afraid I’ve found one teensy, weensy exception. 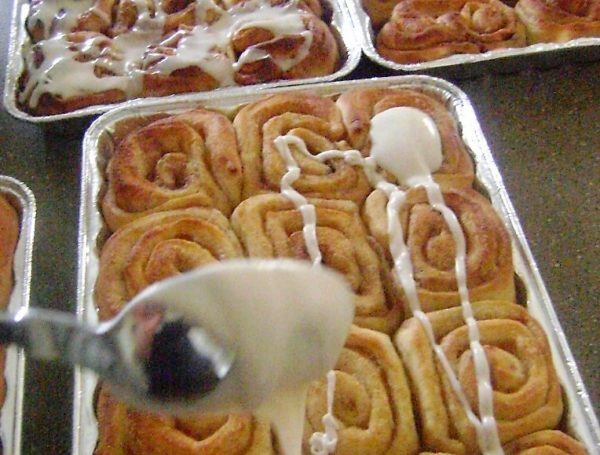 One of my cute little moms in my cute little class brought a couple pans of these amazing…no, no…FABULOUS cinnamon rolls–and seriously, it was all I could do not to hang on her leg as she went out the door. Lucky for me, and now you–she is a very good recipe sharing girl (thanks *Megan!). Before we start here, let me just make one gigantic disclaimer. 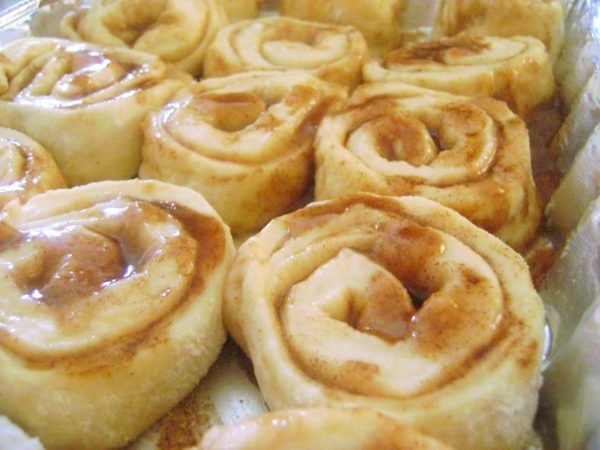 This recipe makes a busload of cinnamon rolls–enough to pass around the neighborhood, maybe even the world. That’s not the disclaimer part. If you make these unbelievable little babies–and I’m thinkin’ you will–and decide to eat the entire batch all by yourself, and the kids find you later that evening sitting on the floor of the pantry with frosting on your chin in a sticky cinnamon stupor—mumbling something about a cruise to Cozumel and Johnny Depp, well now, my friends, I’m just not going to take responsibility for that. 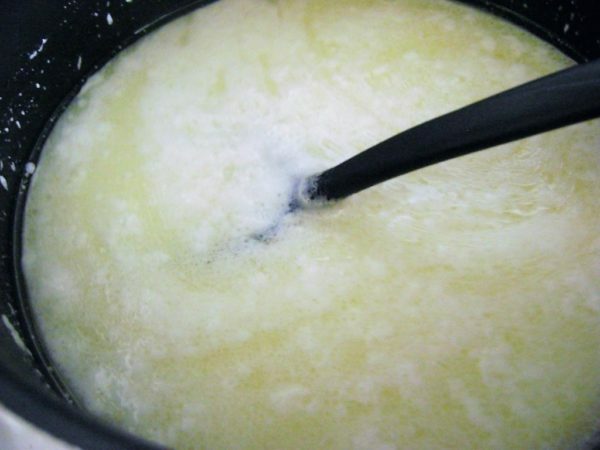 Mix milk, oil, and sugar in a large saucepan and heat to “scalding.” That means—just before it starts to boil. You don’t have to stir it the whole time but I would advise you not to wander off. It will boil over in a foamy-frothy-messy surge the second you do. Don’t ask me how I know this. Turn off the heat and let it cool for about an hour. NOW you are free to explore the universe…for only an hour. Set a timer. Once it rings, and you make sure it is lukewarm, sprinkle the yeast over the top. Leave it a few minutes to soften and do it’s thing. When you come back, add 8 cups of flour to the mixture and stir it in. Cover with a warm, wet towel and let it sit for one hour. Now you are free to go again–until the timer rings. Stir in the final cup of flour with the baking powder, soda and salt. Mix well, right there in the pan. Flour the counter generously. 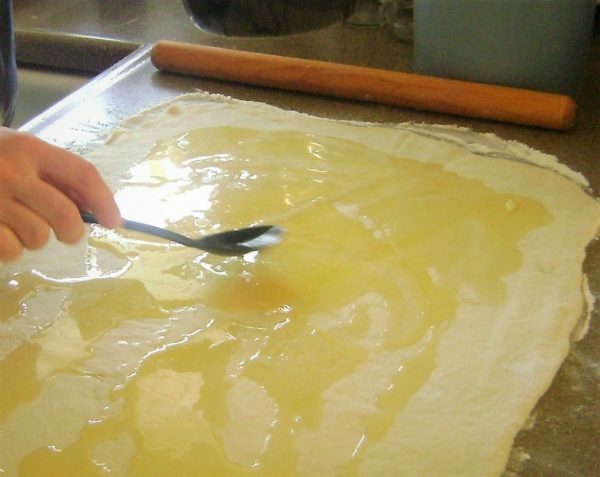 Take half the dough at a time and pat it out into a rectangle. Now start rolling it into a bigger and more glorious rectangle. Gently smush up the edges a bit so that the next step works better. 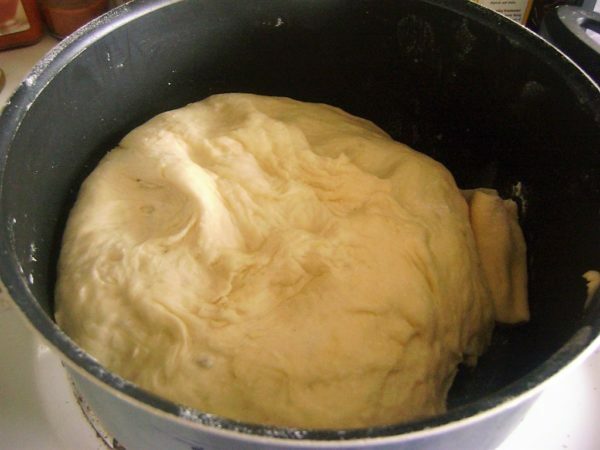 Pour the butter over the dough. Now sprinkle 1 cup of sugar evenly over the dough. 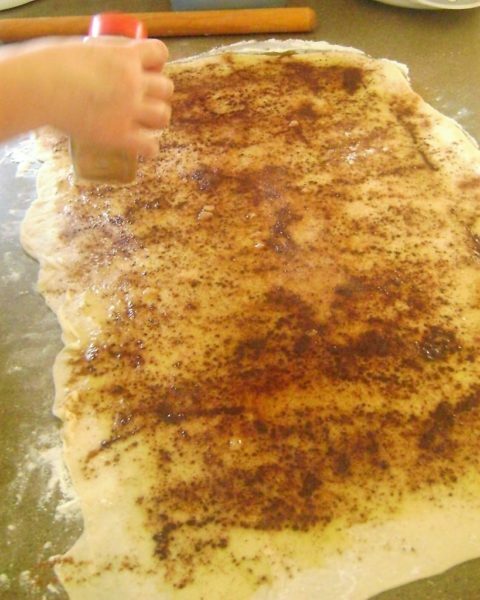 Next, sprinkle cinnamon generously over the sugar. I thought I was going way over board, but seriously, we could have put even more and been good. 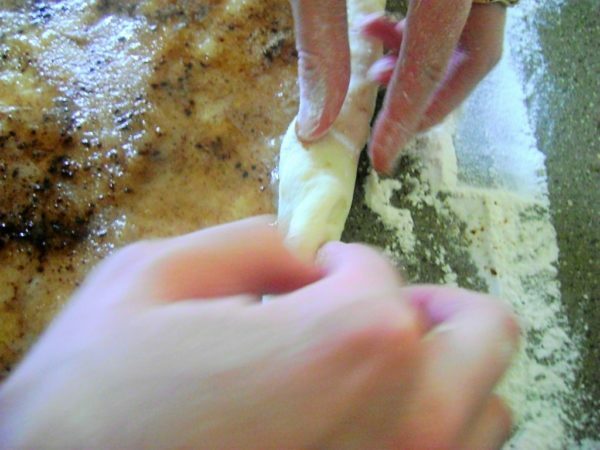 Starting from the far side, start rolling the dough as tightly as you can towards you. 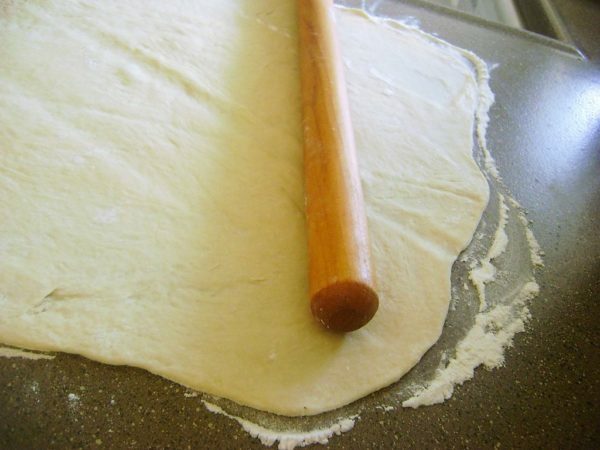 When you get nearly to the end, stop rolling and carefully pull the dough edge up and pinch it to the roll. That will help keep all that sugary goodness inside the roll. Butter four 9×15 pans and have them ready. You can cut the rolls in 1 inch slices with a knife or use the thread method (remember the pumpkin roll?). Place them in the pans and let them sit and get to know each other for about 20 minutes. Heat the oven to 400 degrees and cook these lovelies for 15-18 minutes–depending on your oven and how it behaves. You want them to be a light golden brown. Stir all the ingredients together in a mixer or by hand–whatever floats your boat. 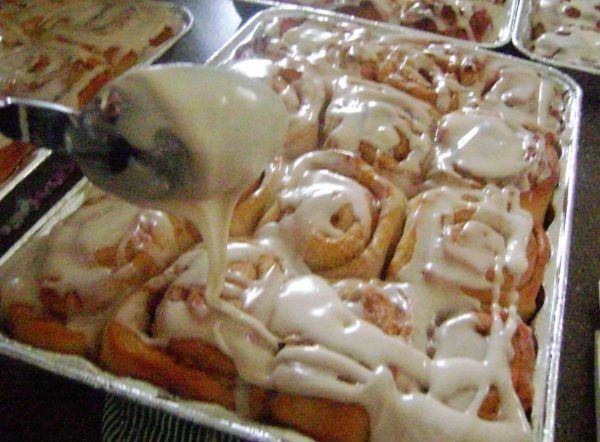 When the cinnamon rolls are out of the oven and cooling safely away from any creature with a working sniffer–you can begin pouring the icing over the cinnamon rolls. Spread it around generously and don’t lick the spoon until you are completely finished…then you’re on your own. All is well in Zion. Turn off the heat and let it cool for about an hour. Sprinkle the yeast over the top and leave it a few minutes to soften. Add 8 cups of flour to the mixture and stir it in. Cover with a warm, wet towel and let it sit for one hour. 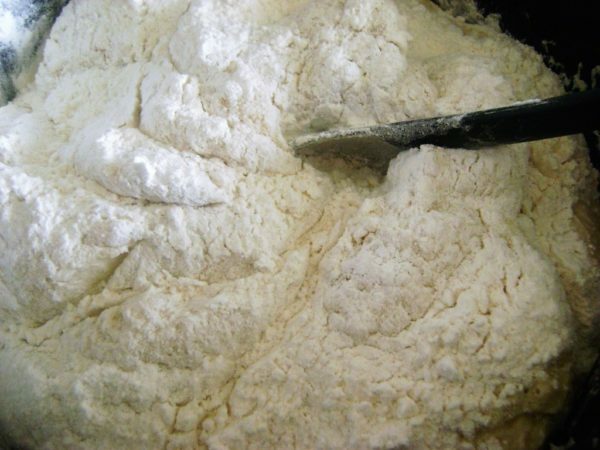 Stir in the final cup of flour with the baking powder, soda and salt. Mix well, right there in the pan. 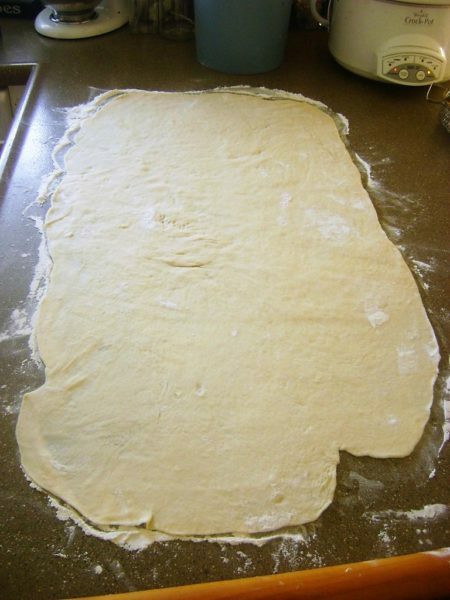 Take half the dough at a time and pat it out into a rectangle. Gently smush up the edges a bit so that the next step works better. 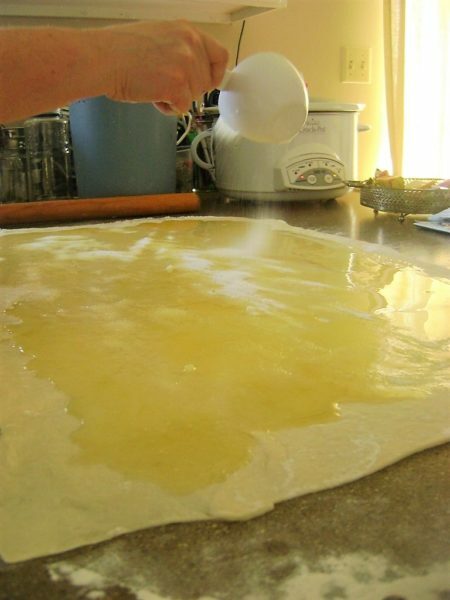 Pour the butter over the dough. Next, sprinkle cinnamon generously over the sugar. 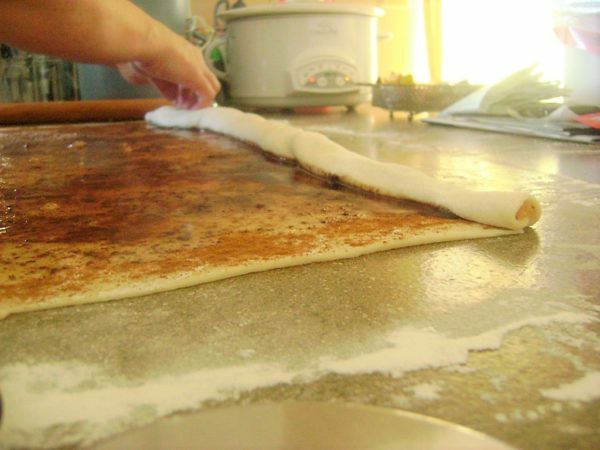 When you get nearly to the end, stop rolling and carefully pull the dough edge up and pinch it to the roll. Butter four 9×15 pans and have them ready. You can cut the rolls in 1 inch slices with a knife. Heat the oven to 400 degrees and cook these lovelies for 15-18 minutes. You want them to be a light golden brown. Allow them to cool completely then frost. Evil Maple Frosting Ingredients: 1-32 oz. bag powdered sugar 2 tsp. maple flavoring ¾ cup of milk ¼ cup melted butter ⅛ tsp. salt Stir all the ingredients together in a mixer. Spread it around generously on cooled cinnamon rolls. They look delicious! Too bad cinnamon rolls are too sweet for me and make me sick. What was cooking in the crockpot on the counter behind you? The makers of Melba Toast and Celery thank you for this post. Pork roast with pesto—for our Spring Equinox dinner. These suckers were GOOD!!! I know for a fact that this is one of the first treats in a while where I had a hard time not coming back for more… and MORE!!! Good job… sort of! 😉 Heh. oh no. so glad to find your blog so sad I will be thinking of these until I make them. Thinking is–indeed, the next best thing to being there…so to speak. However, in this case–being there is still WAAAAAY better. Go now–make them. Join us in our decadence. You’ll never be the same. Quite certain these will make the menu for Conference as well. Maybe you should just come…”hangout” with us. Okay, this just about convinced me to move to Orem. . . TODAY. But then reality hit me – they’re gone aren’t they. 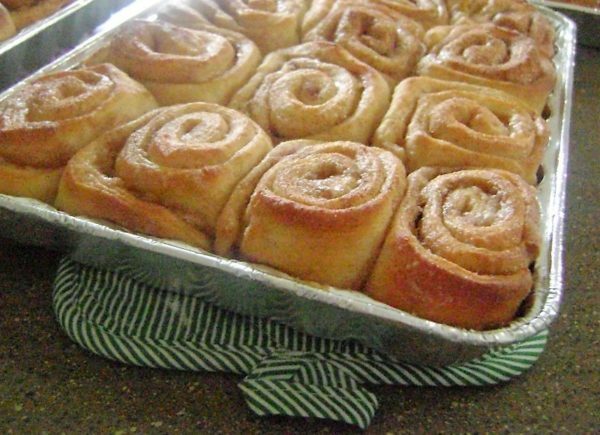 Maybe you should publish your daily schedule on your blog in the future and when cinnamon rolls make the list I can rearrange my schedule and be waiting on the front porch to high jack the plate intended for the neighbors! These look decadently amazing. I used to have this recipe for a pecan and cinnamon teacake that was quite similar and it was DELICIOUS. And then I lost the recipe. Tragedy. The bag she used was a 16oz package. I’ll have to look up what that is in grams! 😀 Hope that helps though! i “stumbled upon” this website and it seemed too familiar. 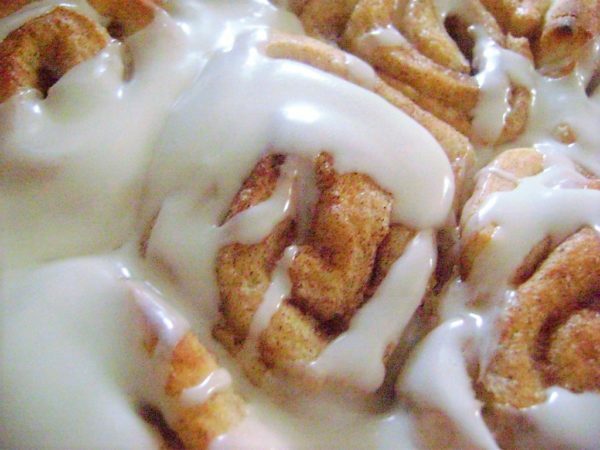 this recipe seems as though it has been taken directly from Ree Drummond’s, aka the pioneer woman’s, awesome cinnamon rolls recipe. aside from one missing ingredient in the maple icing and the rearrangement of certain items on the ingredients list, everything is coincidentally too similar. thought i should let you know considering the fact that yours is a copyrighted website. Yes, you’re right. The Pioneer Woman acknowledgment is given at the end of the post. It looked like a fabulous recipe so we made it ourselves and showed and shared the results giving her the credit for the “untweeked” version. Just one of the awesome things about the internet and blog sharing… you can mix and match and try things and do things your own way. I love seeing how people take something I do the same way EVERY time, and turn it into something different and amazing… a way I wouldn’t have thought of. Kim, now you’ll have to take this recipe and see what you can do with to make it just right for you! Actually, the “bag” is two pounds…or 32 ozs…or about 900 grams. Thanks so much for bringing this to my attention. I’ll go fix it in the post this very minute. I’ve read that you can refrigerate or freeze the dough after you add the last dry ingredients, and that works fine. So, I would imagine they would be freezable right before baking–like the ones you can buy in the freezer case at the market. Do it man, and let me know how it goes. That would be so smart. Oh, my-my, they are indeed! 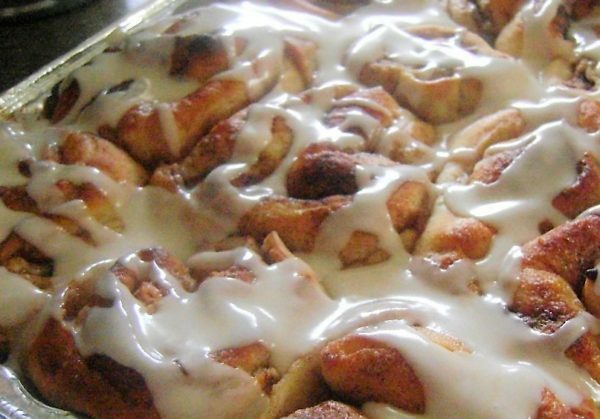 I have been looking for a signature way to make Cinnamon Rolls. Hopefully, this recipe will prove delightful. I stumbled on this and instantly had to make them.. so I am at the first hour now! I hope they turn out I am no good with bread! But I thought this would be a nice treat for my hunk! Thank you! He will love them…YOU will love them…Everyone will love therm!! I rolled them out a little too thin so they were very floury, but the taste was amazing! Im going to buy flour and try again! I am really horrible at bread and dough! Thank you for this though, they were great and my husband was very happy that I did this for him! 🙂 Now can you freeze them before you bake them so you have some for later? I’ve been told that once you’ve rolled them up and have them in the pans, then you can wrap them up in ziplock bags and freeze them. So, before that last raising time–instead, freeze them. Then when they thaw, they will also rise. I haven’t done it myself because there are always enough big boys to eat the whole batch–but this is how I would do it…if I were to do it. These can be frozen. I would stick them in a deep freeze and then when frozen, put them in a zip lock bag. Then, when you are ready, take them out of the bag, put them on in a pan, let them thaw and whalah! Rolls! Well, they’re rolls after they’re baked, lol! OMG. These things look positively sinful. I could easily see myself waking up in the middle of the night and sneaking to the kitchen for seconds. Or thirds. Or blatantly gobbling down in front of everyone. heh, heh. Could I substitute the maple flavoring for real maple syrup? If so, would I still use 2 tsp?? 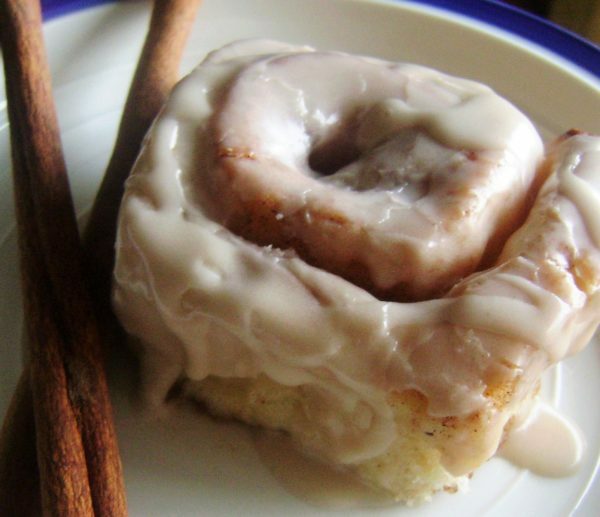 Can’t wait to make these for my cinnamon-roll-loving-boyfriend for Valentine’s Day! 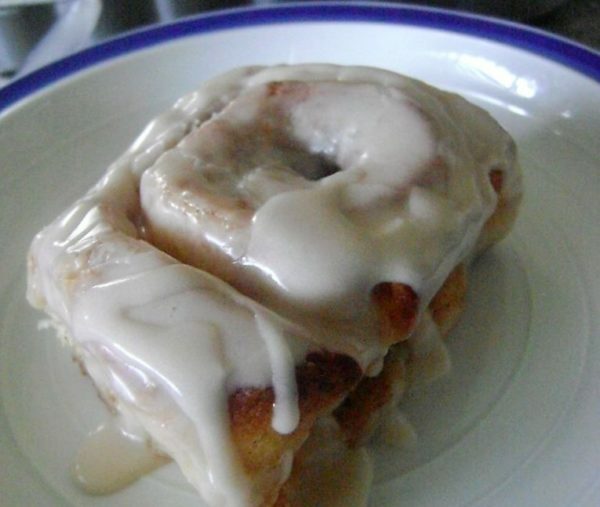 These cinnamon rolls look awesome! A favorite weekend breakfast treat for me! DEFINITELY a must-bake!! KUDOS to your Mama, and to you for posting this decadent recipe!!!!! What we do is we sometimes stuff it with little bits of cheese to give it a different flavor. So what happens if your oven stops at 220 degrees ? I actually did this and they were reeeaaally good but my frosting came out brown, is that right….? I found your site and recipe via pinterest! These looked so amazing, I made them tonight. They are cooling as I write so I haven’t tasted them yet, but they look and smell divine. I keep trying my hand at cinnamon rolls and never quite hit the mark. It seems mine are never big and fluffy. I misread your instructions and ended up using (5) pans, three round and two 8X8 square pans. In my square pans, there are 9 rolls. Can you offer any advice, did I squish too many in the pan to rise to the “fluffy” status? Or just not give them enough time to rise before baking? I would love any suggestions you may have in the cinnamon roll department! 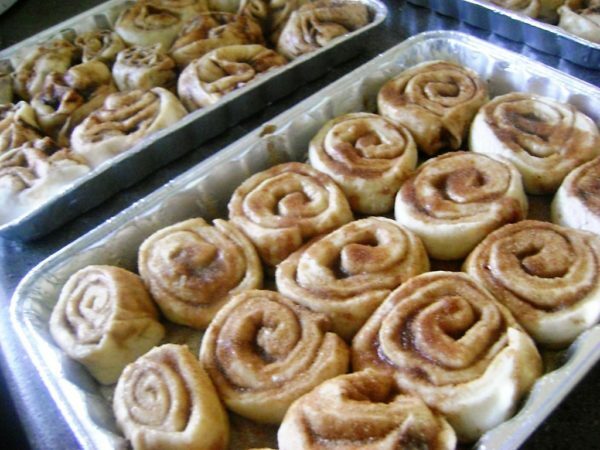 I’m going to try to divide this recipe, there is no way that me and my family need four pans of Cinnamon rolls…. Today, but this recipe looks amazing. It’s a totally different technique form the one I normally use. Thanks for sharing it! me again. Just want to add that I am not picky, so anything you want to make and send me I’m ok with!… anyone….anything….buttercream…. you know.